TWO years ago Ricky Stuart’s monster pack went within a whisker of delivering the Raiders their first grand final appearance since 1994. The unstoppable grunt factory led by massive front-row pairing Shannon Boyd (122 kilos) and Junior Paulo (123 kilos) routinely won the battle of the middle of the field that year. Throw Josh Hodgson’s wily dummy half play into the mix and a powerful, athletic backline and Stuart had found an intoxicating recipe for rampaging attacking football that took his side to second on the ladder and a preliminary final with the Storm. They could easily have won it too, if not for a couple of individual errors and 50/50 calls when the game was hanging in the balance in the last 15 minutes. Fast forward 18 months and Canberra’s formula since that game is largely unchanged: they rely on some very big men to get them on the front foot and hope they can beat their opponent into submission. It’s a formula that must start facing fresh questions with a sense of deja vu washing over Raiders fans who became used to losing cliffhangers in 2017 and watched it happen again on Sunday. The game plan was looking slick in the opening 15 minutes when Canberra scored three quick tries on the back of a mountain of possession. But by the end of the contest Stuart’s men were gasping for air after defending for the majority of the second half. The possession swung right around, with the Titans having 59 per cent of the ball over the 80 minutes and the seemingly inevitable dagger blow was delivered by a home side riding a wave of momentum. Any coach will tell you it’s tough to win a game without the ball but regardless the Raiders routinely find themselves within a score of victory in the last 10 minutes. Over the past four years they’ve become the worst team at getting over the line. 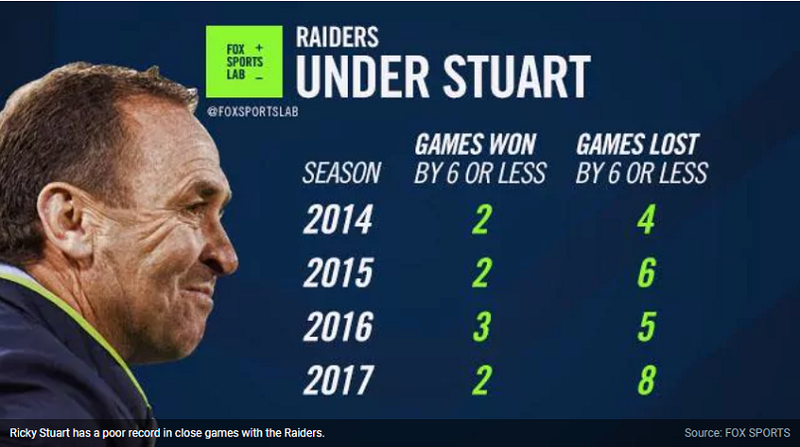 Including Sunday’s two-point loss to the Titans, the Raiders have lost 24 games by six points or less under Stuart. Over the same period they’ve won just nine by a converted try or less. Throw in one draw over the same period and you get a dismal 26.5 per cent win rate in close matches under the premiership coach. That’s the worst in the competition over that period by a decent margin, with even the Knights boasting a better record in tight ones — a 30 per cent win rate. Of course luck plays a part in the close ones but there comes a time when a statistic like that starts to scream ‘something’s wrong’. 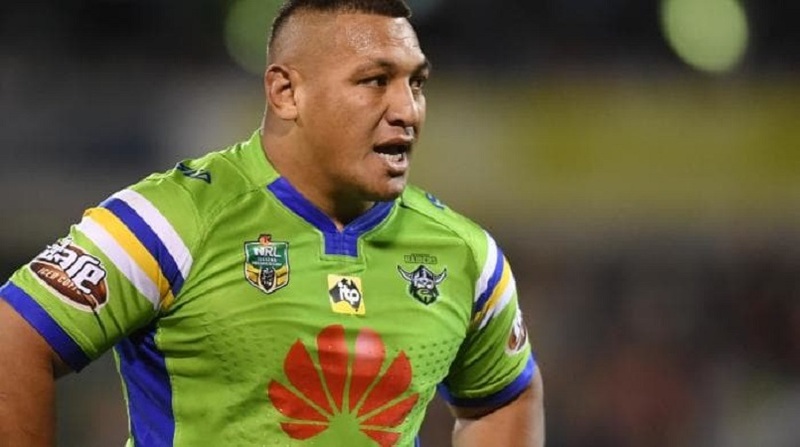 And while every other forward pack in the competition is trimming down to combat a game that’s got faster over the last few years, Canberra still have the bulkiest big men in the NRL. 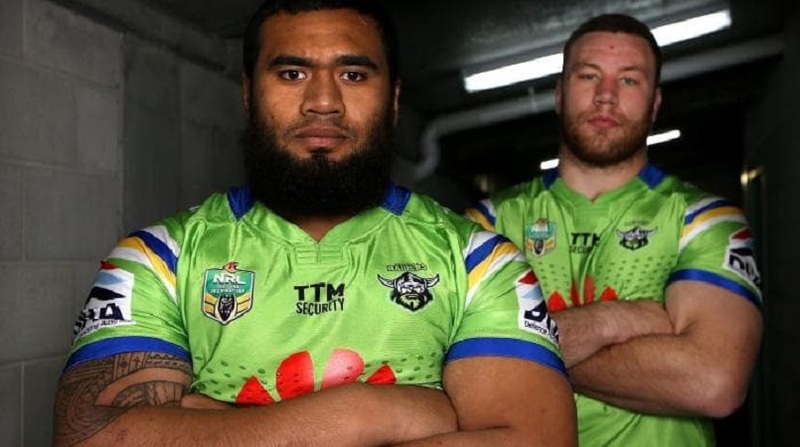 The Raiders are the only team with two props tipping the scales at over 120 kilos and are one of the very few who ever field a pack with three men — Paulo, Boyd and the 112 kilo Josh Papalii — weighing more than 110 kilos. It’s difficult if not impossible to find objective evidence that the reason for the Raiders’ tight losses is that they’re too heavy and run out of gas before their opponents but what’s the alternative theory? That they’re mentally weak? Given it’s a very similar roster to the one that marched to within an inch of a grand final in 2016, that’s a tougher theory to stand up but it’s possibly an easier problem to fix. The selection of Stuart’s starting side on Sunday could be interpreted as a concession that the balance of his pack is askew, with the 100 kilo Sia Soliola starting alongside Boyd, while Paulo was relegated to the bench. If it’s true that the NRL has moved on from a brief time of nostalgia when massive packs were king then the Raiders have missed the bus, at least for 2018. They’ve been all-in on the ‘bigger is better’ strategy since Stuart arrived and it’s a roster blueprint that can only be redesigned by going to market and investing in players who offer something different. As fate would have it, Canberra’s three heavyweights are all off contract at the end of this season. That puts the club’s recruitment team in a good spot to change the focus; strip some weight from their scrum and start on the path to a game plan that values mobility over power. Will they take that chance? Only time will tell. In the meantime the Raiders, like every other team, will have their chances to win tight games. Fail to turn around the current trend and any argument against drastic changes will fall by the wayside.